External spur gears are cylindrical gears with straight teeth cut parallel to the axes. Gears transmit drive between parallel shafts. Tooth loads produce no axial thrust. Excellent at moderate speeds but tend to be noisy at high speeds. Shafts rotate in opposite directions. Internal spur gears provide compact drive arrangements for transmitting motion between parallel shafts rotating in the same direction. Helical gears are cylindrical gears with teeth cut at an angle to the axes. Provides drive between shafts rotating in opposite directions, with superior load carrying capacity and quietness than spur gears. Tooth loads produce axial thrust. Crossed helical gears are helical gears that mesh together on non-parallel axes. Straight bevel gears have teeth that are radial toward the apex and are of conical form. Designed to operate on intersecting axes, bevel gears are used to connect two shafts on intersecting axes. The angle between the shafts equals the angle between the two axes of the meshing teeth. End thrust developed under load tends to separate the gears. Spiral bevel gears have curved oblique teeth that contact each other smoothly and gradually from one end of a tooth to the other. Meshing is similar to that of straight bevel gears but is smoother and quieter in use. Left hand spiral teeth incline away from the axis in an anti-clockwise direction looking on small end of pinion or face of gear, right-hand teeth incline away from axis in clockwise direction. The hand of spiral of the pinion is always opposite to that of the gear and is used to identify the hand of the gear pair. Used to connect two shafts on intersecting axes as with straight bevel gears. The spiral angle does not affect the smoothness and quietness of operation or the efficiency but does affect the direction of the thrust loads created. A left-hand spiral pinion driving clockwise when viewed from the large end of the pinion creates an axial thrust that tends to move the pinion out of mesh. Zerol bevel gears have curved teeth lying in the same general direction as straight bevel teeth but should be considered to be spiral bevel gears with zero spiral angle. Hypoid bevel gears are a cross between spiral bevel gears and worm gears. The axes of hypoid bevel gears are non-intersecting and non-parallel. The distance between the axes is called the offset. The offset permits higher ratios of reduction than is practicable with other bevel gears. Hypoid bevel gears have curved oblique teeth on which contact begins gradually and continues smoothly from one end of the tooth to the other. Worm gears are used to transmit motion between shafts at right angles, that do not lie in a common plane and sometimes to connect shafts at other angles. Worm gears have line tooth contact and are used for power transmission, but the higher the ratio the lower the efficiency. Active face width is the dimension of the tooth face width that makes contact with a mating gear. Addendum is the radial or perpendicular distance between the pitch circle and the top of the tooth. Arc of action is the arc of the pitch circle through which a tooth travels from the first point of contact with the mating tooth to the point where contact ceases. Arc of approach is the arc of the pitch circle through which a tooth travels from the first point of contact with the mating tooth to the pitch point. Arc of recession is the arc of the pitch circle through which a tooth travels from its contact with a mating tooth at the pitch point until contact ceases. Axial pitch is the distance parallel to the axis between corresponding sides of adjacent teeth. Axial plane is the plane that contains the two axes in a pair of gears. In a single gear the axial plane is any plane containing the axis and any given point. Axial thickness is the distance parallel to the axis between two pitch line elements of the same tooth. Backlash is the shortest distance between the non-driving surfaces of adjacent teeth when the working flanks are in contact. Base circle is the circle from which the involute tooth curve is generated or developed. Base helix angle is the angle at the base cylinder of an involute gear that the tooth makes with the gear axis. Base pitch is the circular pitch taken on the circumference of the base circles, or the distance along the line of action between two successive and corresponding involute tooth profiles. The normal base pitch is the base pitch in the normal plane and the axial base pitch is the base pitch in the axial plane. Base tooth thickness is the distance on the base circle in the plane of rotation between involutes of the same pitch. Bottom land is the surface of the gear between the flanks of adjacent teeth. Center distance is the shortest distance between the non-intersecting axes of mating gears, or between the parallel axes of spur gears and parallel helical gears, or the crossed axes of crossed helical gears or worm gears. Central plane is the plane perpendicular to the gear axis in a worm gear, which contains the common perpendicular of the gear and the worm axes. In the usual arrangement with the axes at right angles, it contains the worm axis. Chordal addendum is the radial distance from the circular thickness chord to the top of the tooth, or the height from the top of the tooth to the chord subtending the circular thickness arc. Chordal thickness is the length of the chord subtended by the circular thickness arc. The dimension obtained when a gear tooth caliper is used to measure the tooth thickness at the pitch circle. Circular pitch is the distance on the circumference of the pitch circle, in the plane of rotation, between corresponding points of adjacent teeth. The length of the arc of the pitch circle between the centers or other corresponding points of adjacent teeth. Circular thickness is the thickness of the tooth on the pitch circle in the plane of rotation, or the length of arc between the two sides of a gear tooth measured on the pitch circle. Clearance is the radial distance between the top of a tooth and the bottom of a mating tooth space, or the amount by which the dedendum in a given gear exceeds the addendum of its mating gear. Contact diameter is the smallest diameter on a gear tooth with which the mating gear makes contact. Contact ratio is the ratio of the arc of action in the plane of rotation to the circular pitch, and is sometimes thought of as the average number of teeth in contact. This ratio is obtained most directly as the ratio of the length of action to the base pitch. Contact ratio – face is the ratio of the face advance to the circular pitch in helical gears. Contact ratio – total is the ratio of the sum of the arc of action and the face advance to the circular pitch. Contact stress is the maximum compressive stress within the contact area between mating gear tooth profiles. Also called the Hertz stress. Cycloid is the curve formed by the path of a point on a circle as it rolls along a straight line. When such a circle rolls along the outside of another circle the curve is called an epicycloid, and when it rolls along the inside of another circle it is called a hypocycloid. These curves are used in defining the former American Standard composite Tooth Form. Dedendum is the radial or perpendicular distance between the pitch circle and the bottom of the tooth space. Diametral pitch is the ratio of the number of teeth to the number of inches in the pitch diameter in the plane of rotation, or the number of gear teeth to each inch of pitch diameter. Normal diametral pitch is the diametral pitch as calculated in the normal plane, or the diametral pitch divided by the cosine of the helix angle. Efficiency is the torque ratio of a gear set divided by its gear ratio. Equivalent pitch radius is the radius of curvature of the pitch surface at the pitch point in a plane normal to the pitch line element. Face advance is the distance on the pitch circle that a gear tooth travels from the time pitch point contact is made at one end of the tooth until pitch point contact is made at the other end. Fillet radius is the radius of the concave portion of the tooth profile where it joins the bottom of the tooth space. Fillet stress is the maximum tensile stress in the gear tooth fillet. Flank of tooth is the surface between the pitch circle and the bottom land, including the gear tooth fillet. 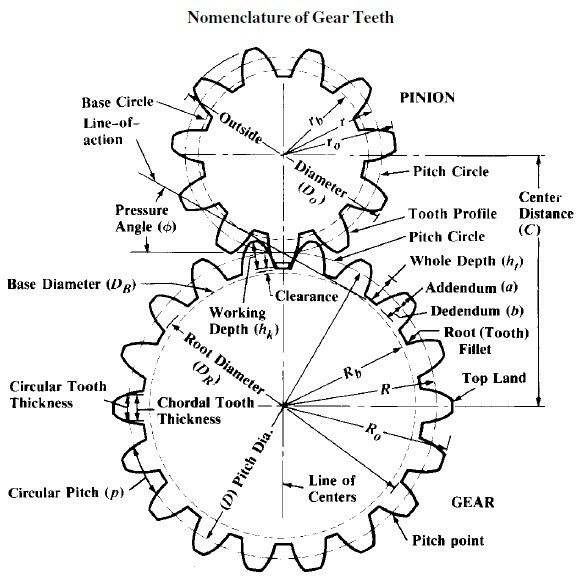 Gear ratio is the ratio between the numbers of teeth in mating gears. Helical overlap is the effective face width of a helical gear divided by the gear axial pitch. Helix angle is the angle that a helical gear tooth makes with the gear axis at the pitch circle, unless specified otherwise. Hertz stress, see Contact stress. Highest point of single tooth contact (HPSTC) is the largest diameter on a spur gear at which a single tooth is in contact with the mating gear. Interference is the contact between mating teeth at some point other than along the line of action. Internal diameter is the diameter of a circle that coincides with the tops of the teeth of an internal gear. Internal gear is a gear with teeth on the inner cylindrical surface. Involute is the curve generally used as the profile of gear teeth. The curve is the path of a point on a straight line as it rolls along a convex base curve, usually a circle. The top land is the top surface of a gear tooth and the bottom land is the surface of the gear between the fillets of adjacent teeth. Lead is the axial advance of the helix in one complete turn, or the distance along its own axis on one revolution if the gear were free to move axially. Length of action is the distance on an involute line of action through which the point of contact moves during the action of the tooth profile. Line of action is the portion of the common tangent to the base cylinders along which contact between mating involute teeth occurs. Lowest point of single tooth contact (LPSTC) is the smallest diameter on a spur gear at which a single tooth is in contact with its mating gear. Gear set contact stress is determined with a load placed on the pinion at this point. Module is the ratio of the pitch diameter to the number of teeth, normally the ratio of pitch diameter in mm to the number of teeth. Module in the inch system is the ratio of the pitch diameter in inches to the number of teeth. Normal plane is a plane normal to the tooth surfaces at a point of contact and perpendicular to the pitch plane. 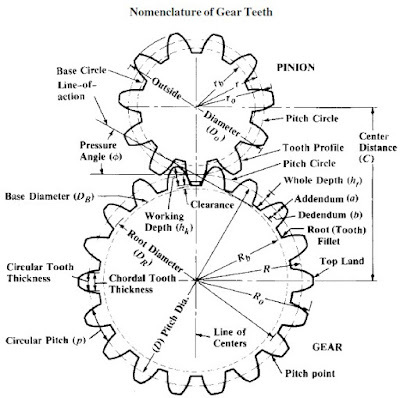 Number of teeth is the number of teeth contained in a gear. Outside diameter is the diameter of the circle that contains the tops of the teeth of external gears. Pitch is the distance between similar, equally-spaced tooth surfaces in a given direction along a given curve or line. Pitch circle is the circle through the pitch point having its center at the gear axis. Pitch diameter is the diameter of the pitch circle. The operating pitch diameter is the pitch diameter at which the gear operates. Pitch plane is the plane parallel to the axial plane and tangent to the pitch surfaces in any pair of gears. In a single gear, the pitch plane may be any plane tangent to the pitch surfaces. Pitch point is the intersection between the axes of the line of centers and the line of action. Plane of rotation is any plane perpendicular to a gear axis. Pressure angle is the angle between a tooth profile and a radial line at its pitch point. In involute teeth, the pressure angle is often described as the angle between the line of action and the line tangent to the pitch circle. Standard pressure angles are established in connection with standard tooth proportions. A given pair of involute profiles will transmit smooth motion at the same velocity ratio when the center distance is changed. Changes in center distance in gear design and gear manufacturing operations may cause changes in pitch diameter, pitch and pressure angle in the same gears under different conditions. Unless otherwise specified, the pressure angle is the standard pressure angle at the standard pitch diameter. The operating pressure angle is determined by the center distance at which a pair of gears operate. In oblique teeth such as helical and spiral designs, the pressure angle is specified in the transverse, normal or axial planes. Principle reference planes are pitch plane, axial plane and transverse plane, all intersecting at a point and mutually perpendicular. Rack is a gear with teeth spaced along a straight line, suitable for straight line motion. A basic rack is a rack that is adopted as the basis of a system of interchangeable gears. Standard gear tooth dimensions are often illustrated on an outline of a basic rack. Roll angle is the angle subtended at the center of a base circle from the origin of an involute to the point of tangency of a point on a straight line from any point on the same involute. The radian measure of this angle is the tangent of the pressure angle of the point on the involute. Root diameter is the diameter of the circle that contains the roots or bottoms of the tooth spaces. Tangent plane is a plane tangent to the tooth surfaces at a point or line of contact. Tip relief is an arbitrary modification of a tooth profile where a small amount of material is removed from the involute face of the tooth surface near the tip of the gear tooth. Tooth face is the surface between the pitch line element and the tooth tip. Tooth surface is the total tooth area including the flank of the tooth and the tooth face. Total face width is the dimensional width of a gear blank and may exceed the effective face width as with a double-helical gear where the total face width includes any distance separating the right-hand and left-hand helical gear teeth. Transverse plane is a plane that is perpendicular to the axial plane and to the pitch plane. In gears with parallel axes, the transverse plane and the plane of rotation coincide. Trochoid is the curve formed by the path of a point on the extension of a radius of a circle as it rolls along a curve or line. A trochoid is also the curve formed by the path of a point on a perpendicular to a straight line as the straight line rolls along the convex side of a base curve. By the first definition, a trochoid is derived from the cycloid, by the second definition it is derived from the involute. True involute form diameter is the smallest diameter on the tooth at which the point of tangency of the involute tooth profile exists. Usually this position is the point of tangency of the involute tooth profile and the fillet curve, and is often referred to as the TIF diameter. Undercut is a condition in generated gear teeth when any part of the fillet curve lies inside a line drawn at a tangent to the working profile at its lowest point. Undercut may be introduced deliberately to facilitate shaving operations, as in pre-shaving. Whole depth is the total depth of a tooth space, equal to the addendum plus the dedendum and equal to the working depth plus clearance. Working depth is the depth of engagement of two gears, or the sum of their addendums. The standard working distance is the depth to which a tooth extends into the tooth space of a mating gear when the center distance is standard. American Gear Manufacturers Assn., 500 Montgomery St., St., Alexandria, VA 22314.